The biggest event in the history of Street Fighter V so far is almost here. For fans of Street Fighter, we’re fast approaching the second most exciting time of the year. The Capcom Pro Tour is all said and done and the Capcom Cup is upon us, taking place in Anaheim, California on December 3rd and 4th. 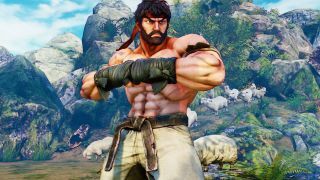 It wraps up the first year of Street Fighter V as a competitive game and the overall winner will be taking home a substantial amount of cash and, brilliantly, gets to design the costume for a character of their choosing to be released in 2017. Rad.Throughout the year, this column has always assumed that a good few of you will be getting into watching competitive Street Fighter for the first time, and if you’ve been following the Pro Tour, let me tell you: the Capcom Cup is always an incredible event. With all 32 players decided and a week or so to go, it’s time to go over the entrants. Who they are, how they got there and what we can expect from them. One of the greatest Street Fighter players going. Rose to ridiculous heights with Street Fighter IV and has shown no sign of slowing down in Street Fighter V. The first person to qualify for this year’s event, the winner of several majors throughout the year and, of course, the winner of this year’s EVO. No one is more qualified that Infiltration. Here’s the thing—we don’t really know right now! Earlier in the year, and most notably at EVO, Infiltration was playing as Nash. Since qualifying, he’s played as a whole load of different characters, including a rather deadly looking Rashid. Towards the end of Street Fighter IV’s life, he had a backpack of characters, never mind a pocket. It’s going to be interesting to see who he brings. The Beast himself! Daigo is a bona fide Street Fighter legend. He's the winner of four EVO championships across multiple games and the guy who did that amazing parry in that Third Strike video, but you already knew that, right? Daigo was already well on his way to qualifying through points after a few ranking event wins throughout the year, but cemented his position when he—somewhat hilariously—won the European Qualifier after gaining entry because of his points total in the region. A US player currently riding a humongous wave of momentum after winning a whole bunch of events with some extremely impressive Guile play. Du won a few events and was clearly going to find a Capcom Cup slot based on his points total alone, but then he won a Premier event and automatically qualified, becoming the only US player in the tour’s history to do such a thing. He has a few characters. An impressive Mika and Nash have provided a fair bit of success for Du but his Guile is absolutely insanely good. So good, Daigo had an episode of his stream dedicated to figuring out what to do against Guile. Definitely the USA’s best hope for winning the Capcom Cup. About the highest profile unsponsored player at this year’s event, after MadCatz cleared their ranks earlier this year. Tokido is one of the five gods of Street Fighter, having success as Akuma in Street Fighter IV and being a mainstay of the top eight of almost every tournament he enters. Tokido spent the first part of this year’s Pro Tour finishing runner-up to Infiltration in several events, before finally getting his revenge at CEO 2016. He managed to triumph over his rival and secure an automatic qualification spot. A somewhat more aggressive Ryu than Daigo, with some sick parries. He also, crucially, has a win over Infiltration’s Nash, which could be helpful in this tournament. The only European player to win a Premier event during this Pro Tour and a constant top eight threat at any tournament he attends. By winning Dreamhack Summer he took one of the automatic qualification spots. On his way to taking first place, he beat Mago, Daigo and Fuudo twice. Probably the best hope for a European victory? Not only is Phenom a phenomenal (sorry) player, he’s playing as one of the best, most effective characters in the entire game in Necalli. Never rule out the man who dunked Daigo five times. China’s Xiao Hai is one of the in-form players headed into Capcom Cup and one of the three players this year who won more than one Premier event during the season. Two Premiers. He automatically qualified twice for Capcom Cup, as well as sitting in joint fifth place in the global leaderboard. Xiao Hai very much deserves his place in this year’s elite 32. The best Cammy in the World. The unfortunate runner-up in the controversial EVO 2015 Grand Final, he hasn’t let that knock his game and has put on some dominant performances during this CPT season. Much like Xiao Hai, Gamerbee won two Premier events, only his were back to back and one week apart. Most impressive. The highest ranking Necalli player on the global leaderboard. Seriously? Justin Wong is about the most famous American fighting game player ever, with countless first place wins in countless tournaments to his name. Continuing with this theme, he qualified for Capcom Cup by winning loads and loads of points at a lot of Ranking events during the year. A Premier was out of reach, but to be honest by August he was already clear ahead of most other players. Hilariously, he’s in the top 3 ranked players on the global, North America and Latin America leaderboards and is top 15 on the Asia one too. EVO 2015 winner and the best Ken player in USFIV is still keeping the Ken dream alive in Street Fighter V. Not quite winning everything like he did in the last game, but still a threat. You simply can’t count out a player with abilities like Momochi, who can completely turn a match in his favour with a superhuman hit confirm. Didn’t enter a massive amount of tournaments this season, but won the StunFest Premier event to automatically secure his Capcom Cup place.